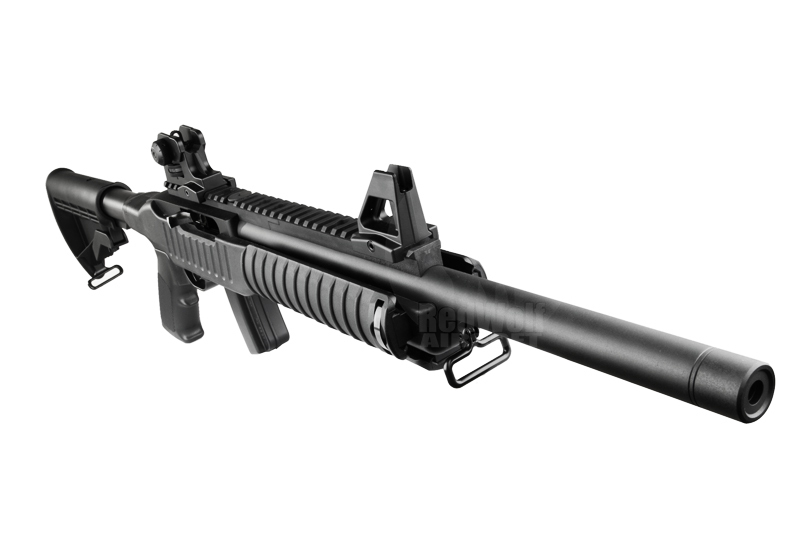 The rifle used an M4 stock tube like structure to attach stocks allowing it to take any M4 compatible stocks and also uses a gas M4 type pistol grip allowing just as much aftermarket options there as well. The weapon in chiefly a sturdy metal assembly riding in a polymer body, a measure which affords the weapons incredibly sturdy structure yet low weight. With a 22 round magazine, the weapon clocks in at a spicy 400 fps and is capable of taking red gas which pushes it up to around 450 fps. The-out-of-the-box accuracy of this weapon is astounding, capable of landing 50mm / 2 inch groupings out to 20m / 65 feet using 0.4g BBs. As a semi-automatic gas weapon, it also allows you to tap off those high accuracy shots with a very decent cycle rate. 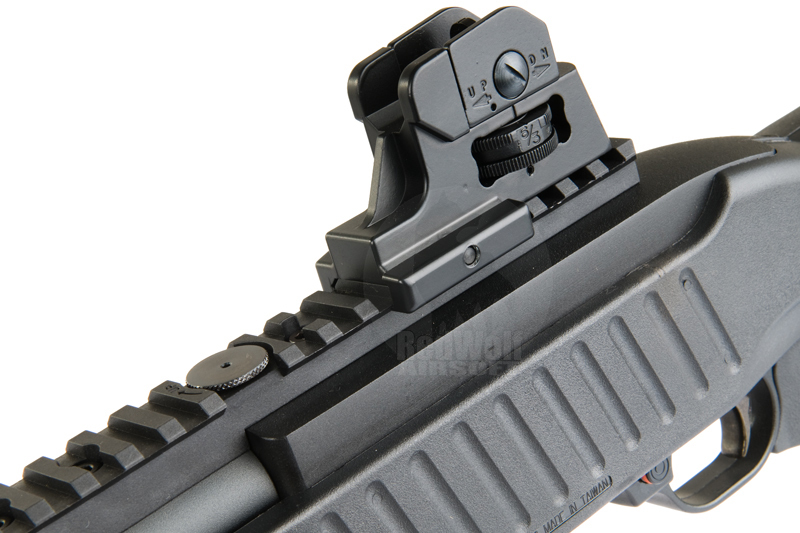 The hop-up adjust dial is on the outside of the weapon, right on top just on the rail just in front of the rear iron sight. This means you can adjust the hop-up while aiming and firing, a superb location. 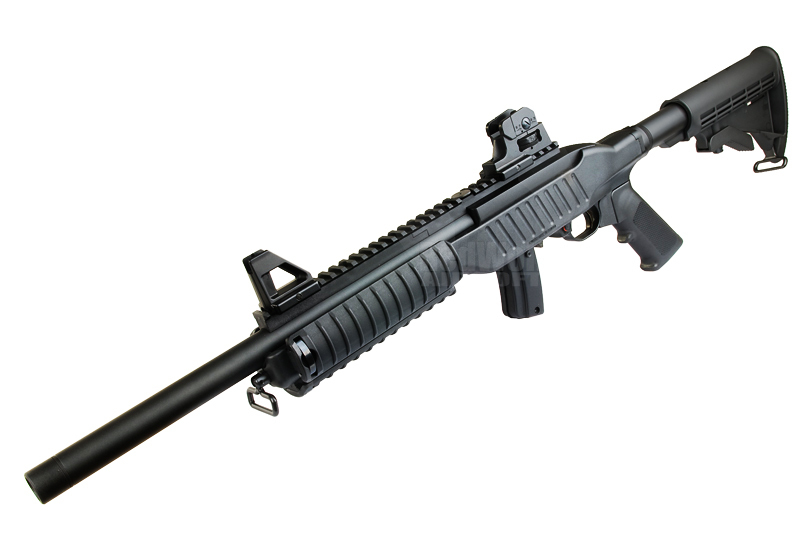 The weapon also has sling swivels on the stock and front end allowing for a convenient slinging option. 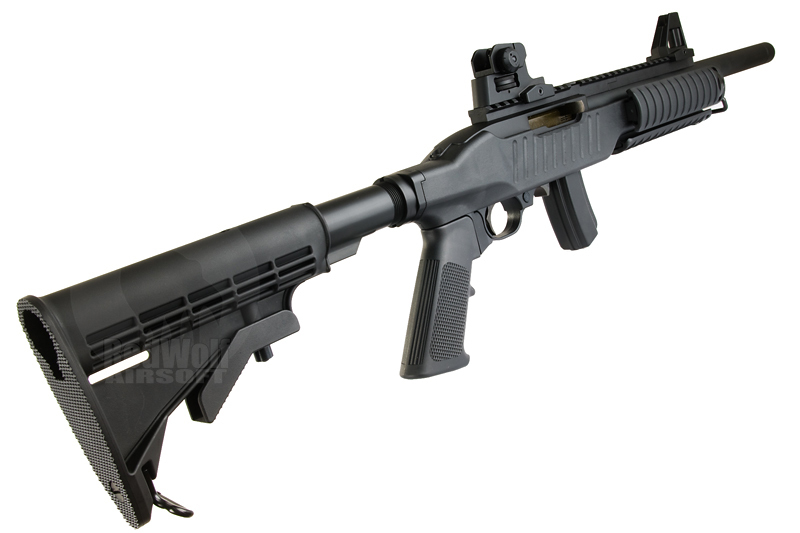 The weapon of course has accessory rails, fairly standard fair on contemporary tactical weapons though not seen quite so thorough on semi-auto rifles like this. A 31.5cm / 12.5 Inch rail lines the top with three more 15cm / 6 Inch rails one each side and the bottom. Options like this allow the use of the whole host of rail-attach accessories available in airsoft. The weapon comes with fixed rail attach iron sights, not quite M16 style but obviously very similar with the M16 style post and two-position ring. 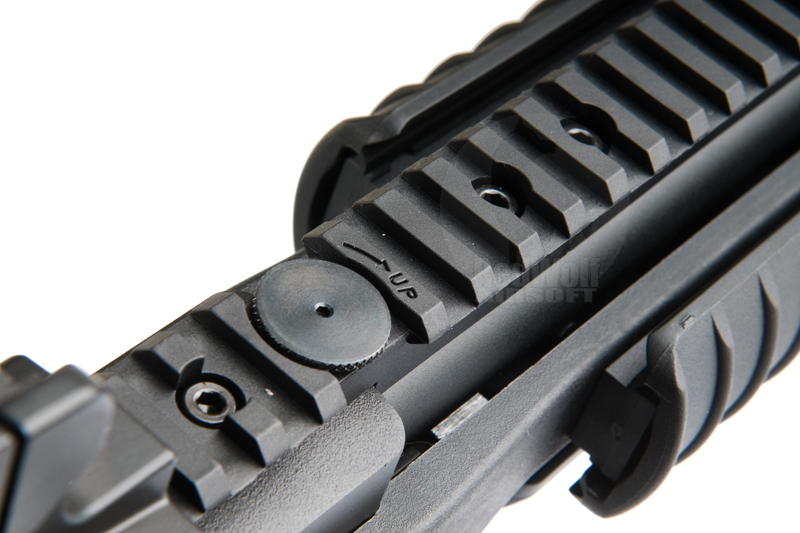 The rear iron sight is adjustable exactly like an M16 sight. 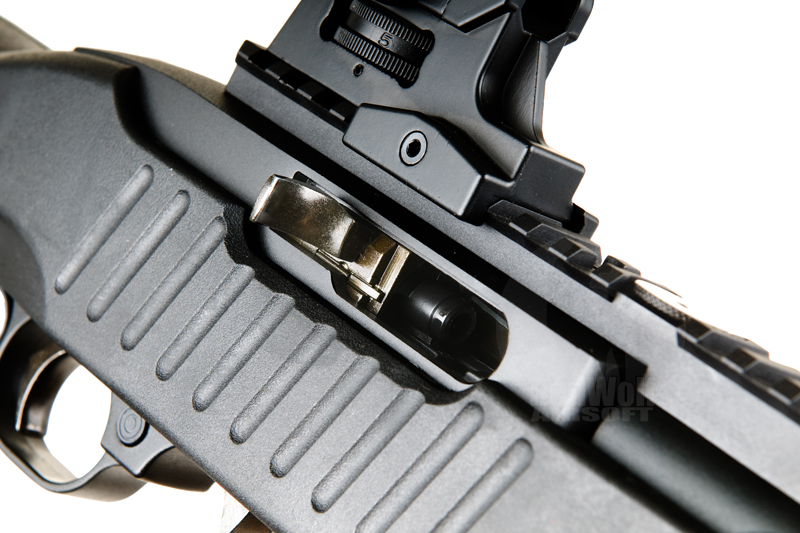 The weapons safety is built into the trigger guard as a side-to-side push button right in front of the trigger. The magazine release catch is a large tab between the magazine and trigger guard. This setup makes the rifles handling fairly ambidextrous but still favoring the right handed crowd a little as the charging handle cycling on the right sight might be a problem (though doubtful). 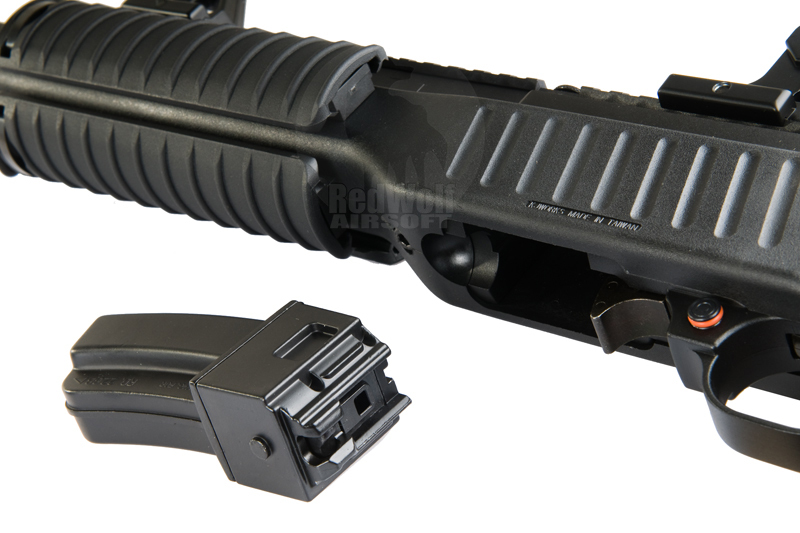 The weapon also comes with three rail covers on the sides and bottom to make the fore end more comfortable when accessories are not in use.